Home Community Community Programs blog: Billy’s goal for an active and healthy lifestyle! Community Programs blog: Billy’s goal for an active and healthy lifestyle! Our Community Programs team work with individuals and their support networks to tailor a unique service delivery and create goal orientated programs. In this week’s blog, Community Support Officer, Sharna, shares Billy’s recent achievements and his health and fitness goals.. In my short time working with Billy I have seen him challenge himself and better his health. Billy is attending the gym once a week with Workpower and is eager to attend the gym on his own once a week. Fortnightly Billy does his food shop and cooks up plenty of healthy meals for dinners and lunches. Billy has learnt that by cooking healthy meals and putting them into containers for dinners and/or lunches he will save money and continue his healthy eating. When Billy eats takeaways he now chooses options like Subway as it is a healthier choice, Billy likes to eat this once he has been to the gym as he feels accomplished. 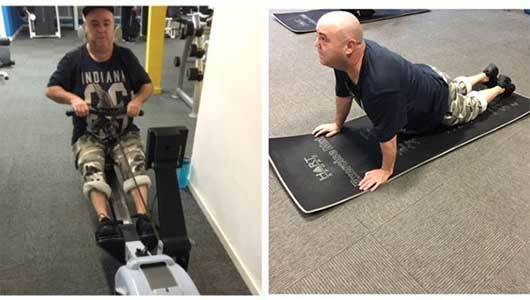 Billy has progressed at the gym and continues to push himself more and more each week, Billy originally started working out for 30 minutes at the gym and now works out for one hour. Each week we set goals/distances for Billy to achieve. Billy is extremely proud of himself once he has achieved his goals at the gym. The gym has improved Billy’s sleeping, reduced his back pain and he is now walking longer distances. Well done Billy and keep up the great work! For more information on the services provided by Community Programs please see our flyer or contact us today!